Item: MAP 154 - Canadian Pacific Railway. Plan of part of branch line from Port Moody. A point on main line C.P.R. to English Bay, B.C. published by Dakin Publishing Co.
Place is uncertain. Actor is uncertain. According to the original map card description, the date was obtained from Oblong Box 5.33 in which part of the map has been reproduced. 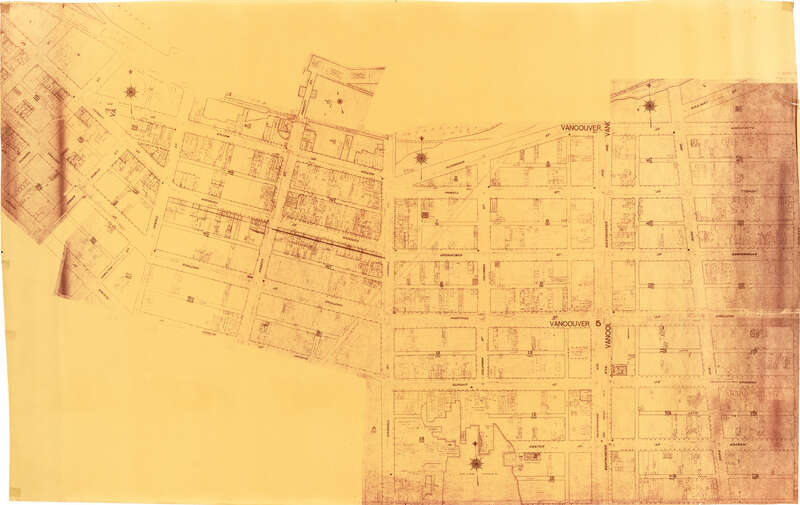 Item is a copy of sections of a November 1889 fire insurance map that have been pieced together. Includes the area between Seymour and Dunlevy Streets, from the south shore of the Burrard Inlet to Keefer Street. Map shows Chinatown, part of False Creek, and buildings and their uses (commercial, residential, industrial). The name of the business, business owner, or type of business is noted for most commercial and industrial buildings. Map has yellowed and has a large tear in the upper right corner. Other tears have been repaired with tape. 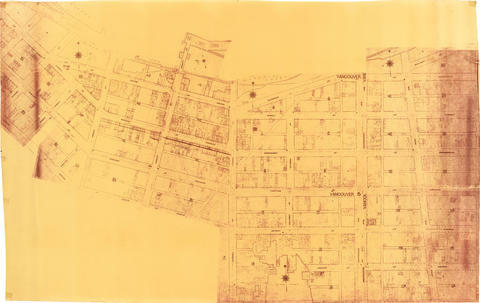 Copy of a blueprint. Date given is that of the original map. According to the original map card description, Oblong Box 5.33 listed the original completed map as being labelled "Dakin Publishing Company, San Francisco."